Peter Weir's most recent film tells the amazing (though possibly not strictly true) story of a group of escapees from a Siberian gulag in 1941. This motley crue of prisoners, which includes the optimistic Pole Janusz (Jim Sturgess), the cynical and mysterious 'Mr Smith' (Ed Harris) and the unpredictable and possibly psychotic thief Valka (Colin Farrell), head out on a colossal journey from Northern Russia all the way down to freedom in India. On their way, they are beset by various troubles, including hunger, insect attacks and extremes of cold (in Siberia) and heat (in the Gobi desert) - and not every member of the party makes it all the way to the end. This is an old fashioned epic, a movie telling an amazing story of courage and fortitude, and despite the film's quite substantial running time, I was never bored by what was on screen. Probably the film's strongest feature is the fantastic camerawork, with cinematographer Russell Boyd making excellent use of the stunning natural backdrops to the journey. Although some of the supporting characters are perhaps a little underdeveloped, I was nevertheless impressed by the majority of the cast - particularly Ed Harris as the enigmatic American escapee, and Colin Farrell as the violent wildcard Valka. Seeing this kind of film makes me wonder how I'd fare if I was put in a similar situation. To be honest, I'd probably have given up the ghost in the Siberian forest, but that only makes you admire the characters who stick it out for the whole journey all the more. When I reviewed Mother a couple of weeks back, I made a comment along the lines of "based on the films I've seen, some of South Korea' s leading directors may be a little unhinged" - and this picture isn't something which is going to change my mind on that front. To be completely fair, the only South Korean films I seek out are either revenge thrillers like Oldboy, ghost stories like A Tale of Two Sisters and serial killer/ police dramas like Memories of Murder and The Chaser, so I'm sure there are plenty of South Korean directors making sweet, innocent, family friendly movies, which I haven't had the inclination to see. Anyway, this is one twisted movie - telling a story of serial murder and vengeance in modern day Seoul. The plot centres on the murder of the wife of top government agent Kim Soo-hyeon (Byung-hun Lee) by a particularly vicious and unrepentant serial killer Kyung-chal (Min-sik Choi). Though Kim is able to use his inside connections to track down his wife's killer relatively quickly, he decides that killing him straight away would be far too lenient. Instead, he decides to implant him with a GPS chip and microphone, then operate a sort of 'catch and release' programme, tracking Kyung-chal's movements and capturing him (and beating him up) again and again. However, when Kyung-chal realises what is happening, he vows revenge against Kim's surviving family members... This movie is directed with great flair, with a number of fantastically stylish sequences (notably a brutal attack carried out in a moving taxi), but I was a little uncomfortable with the sheer amount of gratuitous violence on screen. Unlike Snowtown last week (where the for the most part the murder was left off screen, meaning that the one particularly brutal and unpleasant scene has all the more impact), I Saw The Devil presents the viewer with so much stylised violence that you soon reach saturation point, and by the end of the movie, nothing seems shocking. I'm not sure that the director, Jee-woon Kim, has anything especially profound to say with all of this mayhem - and for that reason, I wouldn't rate this movie as highly as other South Korean revenge thrillers like Oldboy or Lady Vengeance. Another stylish revenge movie, Confessions is kind of like a Japanese take on 'Unman, Wittering and Zigo'. In the powerful opening sequence, we see a strangely calm middle school teacher, Yukio Moriguchi (Takako Matsu), telling a class of unruly teenagers that she is to leave the school at the end of spring. As the class begin to pay attention to what their teacher is saying, she explains that reason for this decision is that she knows two members of her class were to blame for the supposedly accidental death of her four year old daughter - and that in order to exact revenge for this tragedy, she has poisoned the milk of the two kids responsible with HIV infected blood. This action leads to terrible repurcussions for all concerned, and we get to hear the stories of all those involved in the tragedy... Sadly, after the excellent opening scene, the film never quite lives up to its promise. Though it is directed with great panache by Tetsuya Nakashima, at times it feels like a series of music videos, loosely strung together. I'm not sure I really bought into the motivation behind the murder by the culprits, and maybe I'm a little naive, but it seemed a little unlikely so many sociopaths could be harboured in the same middle school class. I was frequently dazzled by the director's visual sense, but ultimately felt like he was using all the weapons in his arsenal to disguise the fact that this movie doesn't really have too much to say. It's nothing too special then, I'm afraid, despite the strong opening and a fairly clever twist at the end. Steven Spielberg's latest effort looks back upon the horror and devastation caused by the first World War through the eyes of a lovely, lovely horse. 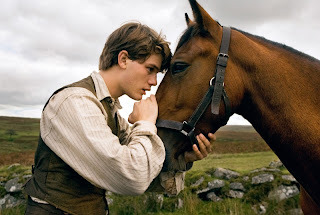 After establishing the bond between said horse (named Joey) and his owner, Albert (Jeremy Irvine), a hardworking young farmhand from Devon, things take an unfortunate turn when both horse and boy are sent off to war in the battlefields of the Western Front. Though Albert's whereabouts are initially unclear, we follow Joey on his travels throughout wartorn France, as he makes a winning impression on a variety of different people: a lieutenant in the British cavalry, a pair of German deserters, a young, sickly French girl and her grandfather, and a kindly German officer. To be honest, I have some fairly serious reservations about this movie, for a variety of reasons. Firstly, the first section of the movie (set in Devon) was very slow paced, with a number of strange contrivances - would a poverty stricken tenant farmer really be able to outbid his landlord for a horse? Why do the country folk of Devon seem so surprised when it turns out to be easier to plow a soft, damp field than hard, stony ground? Also, despite Richard Curtis having a hand in writing the script, I found the dialogue to be rather clunky, using awkward, unnaturalistic speech and too much exposition. Although Spielberg has assembled a strong cast, including the likes of Peter Mullan, Emily Watson, Benedict Cumberbatch. Toby Kebbell and Eddie Marsan, nobody really distinguishes themselves on the acting front, and I found it to be rather irritating that rather than having German and French characters speak in their own langauge, with subtitles, they instead spoke dubiously accented English. Despite all of those weaknesses, this is still a very handsome production, with generally strong cinematography, and for me, the film was almost redeemed by a couple of tremendously powerful sequences - the first bringing home the terror of the trenches, as we follow a brigade of British troops heading over the top, and the second showing Joey running through the trenches and no mans land in a bid for freedom. Overall though, a bit of a disappointment, and apparently not a patch on the stage version currently on show at the National Theatre. This frenetic French thriller sees Samuel Pierrot, a trainee nurse (played by Gilles Lelouche) become an unwilling participant in a stand off between a safecracker named Hugo Sartet (Roschdy Zem), and a corrupt police squad. 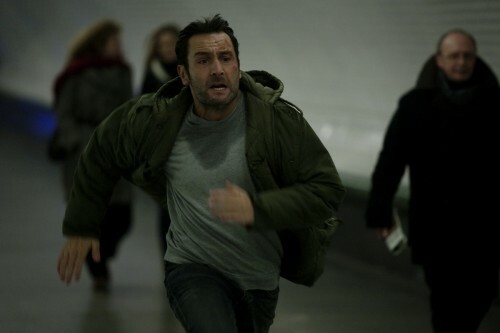 After saving Sartet's life in hospital, Pierrot is targetted by the safecracker's partner - and is informed that unless he helps Sartet escape, his wife will die. Pretty soon, the whole Parisian police force is on the tail of the runaway pair, and their only chance of saving Pierrot's wife and clearing Sartet's name is to work together against the crooked cops. This is a well made, fast paced (but rather short) movie in which we are never given a moment's respite. Poor old Elena Anaya, who was also held against her will in the last film I saw her in (The Sky I Live In), is held captive for most of the film's running time, and spends a good chunk of the story tied to a chair in a dank warehouse. I just hope her agent can find her a role in which she gets a bit more freedom, and maybe the chance to work outdoors next time. Anyway, while the film hardly a classic, it kept me interested throughout and it rattles to a fitting conclusion at a breakneck pace.